September 4/5, 1944: This attack was a follow up to the attack of August 25/26. The first attack did considerable damage to the marshalling yards, however, several tracks remained serviceable. The object of this nights attack was to cut the remaining lines. Because their usual aircraft was undergoing repairs, Flight Sergeant MacIsaac and his crew flew this operation in Wellington Mk.X LN855 - "B". They took off from Tortorella at 1908 hours with a payload of nine 500 and seven 250 pound bombs. ETA over the target was two hours. 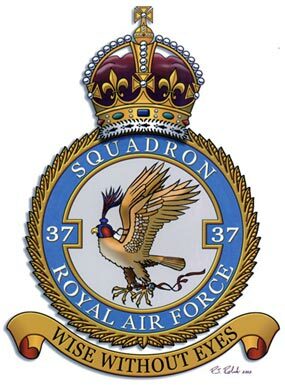 Nine 37 Squadron aircraft operated. One, Wellington "L" flown by Sgt. Taylor, was forced to return early after the port engine failed on the outbound leg of the attack. Opposition over the target was negligible - three to four heavy AA batteries whose firing was mostly inaccurate. 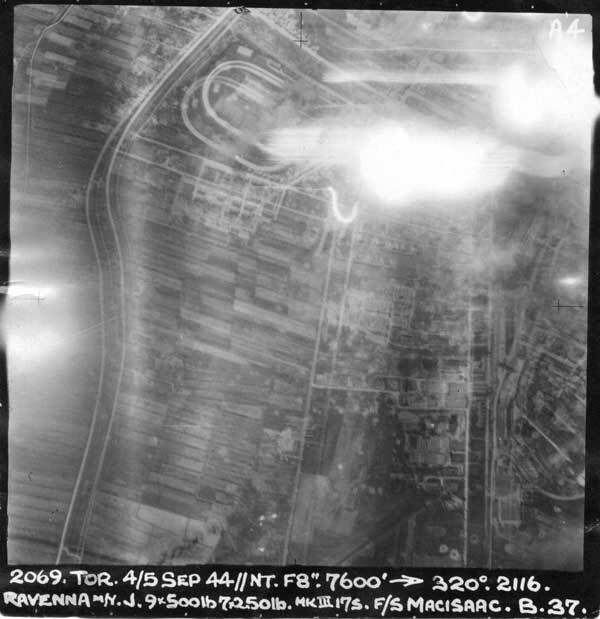 MacIsaacs Aiming point photo over Ravenna of September4/5, 1944. The canal, which was to be the target of attack on September 9/10, 1944, is visible near the top center, just above the AA emplacements. Illumination was well placed. Red target markers fell on or around the southern section of the marshalling yard near the junction with the canal. The eight remaining aircraft attacked, dropping one 4000 pound bomb, fifty eight 500 pound bombs, forty two 250 pound bombs and sixty two packets of nickels. Of the 500 pound bombs, eighteen were equipped with time-delay fuses - six with 8 minutes delay, four with one hours delay and eight with an eight hour time-delay. Bombing was well concentrated on the target. One Wellington, "E" captained by Sgt. Reynolds, had a 4000 pound "cookie" hang-up in the bomb rack. This was later jettisoned over the sea on the return leg. MacIsaac bombed on the red TI’s at 2116 hours on a heading of 320 degrees from 7600 feet but slightly overshot the target. He reported seeing his bombs burst at the canal junction with the yards, a good concentration of bombing, and a large fire visible for 40 miles. All attacking aircraft took photos plotted on the correct headings, but a number of overshoots were evident. Wellington "Y" of 37 Squadron, flown by P/O Jefferies, RNZAF, won the "best photo" of the Wing. MacIsaac landed at Tortorella at 2317 hours. There were no losses on this operation, however, the Group lost one aircraft and crew on September 6/7 over Bolonga.